All aboard the Enchanted Railroad! Take a light-hearted look at Descanso Gardens from a 1/8th replica of a diesel train. The Enchanted Railroad is a Descanso icon, delighting young and old who climb aboard. The railroad travels a section of the Gardens near the Promenade. Located just inside the garden gate, the Center Circle garden demonstrates how lush and beautiful a water-wise garden can be. 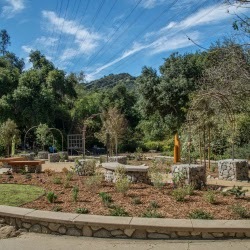 The Center Circle garden presents a new look for Los Angeles gardens – one that foregoes the traditional lawn in favor of plants that are more vibrant and lower maintenance. Breathe in the perfume of this 5-acre garden devoted to America's most popular flower. More than 3,000 roses represent centuries of horticultural history and dozens of regions from around the world. 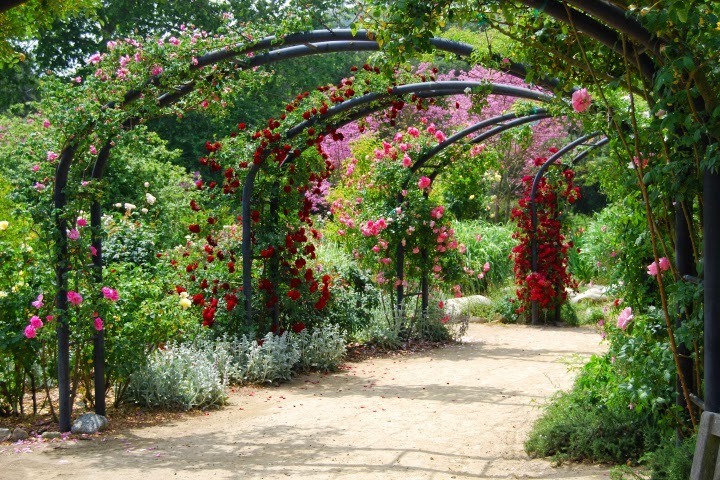 Significant collections of species, old garden and modern roses are arranged in theme gardens. The collection includes most of the All-America Rose Selections (AARS) winners since 1940. Discover the tranquility of a Japanese-style garden that blends design elements of classic tea, strolling and zen gardens. Cross an arched bridge and stroll on shaded paths along a koi-filled stream to the Full Moon Tea House, designed by Whitney Smith and built in 1966. The blue tile roofing, imported from Japan, is especially striking in the spring when nearby pink cherry and plum trees are in bloom. The tea house is open limited hours during the summer as the Camellia Lounge and for special occasions during the year. Nearby, the minka (traditional farmhouse) was designed and donated by Robert H. Kawashima in 1969. Experience the giants in the Descanso landscape, the Coast live oaks (Quercus agrifolia). These trees, some centuries old, are the remainder of a forest that once blanketed the region. The Coast Live Oak typifies the natural Southern California coastal landscape. These trees are flowering plants and belong to the beech family (Fagacea). There are 19 species of Quercus native to California. The Coast Live Oak is an evergreen tree oak. Its natural distribution ranges from California’s Mendocino County along the Coast Ranges down to northern Baja California. The Coast Live Oak is known as a “keystone species,” meaning that the tree supports the existence of hundreds of other species, including mammals, birds, insects, fungi, plants, and even reptiles and amphibians. The Tongva people who made this region their home relied on acorns as an important food source. The importance of the Coast live oak in the interconnected web of life cannot be overstated. An edible garden planted with fruit trees and seasonal vegetables along with herbs, edible flowers and other tasty accoutrements. The area is enveloped with vines, bushes, shrubs and greenery. Like the home garden, the bounty varies from season to season, including citrus, pomegranates, pumpkins and squash, herbs, greens, amaranth, corn -- even apples! Showcasing the delights of the Southern California landscape, this original 8-acre garden was designed and dedicated in 1959 by a core group of California native plant lovers who wanted to cause a revival of interest in California flora, educate school children in native plants and create a demonstration landscape for home owners. Many hands went into creating this new garden, including famed native plant advocate Theodore Payne who led the way by donating 1,000 plants and playing a major role in its design. Likewise, Percy Everett of Rancho Santa Ana Botanic Gardens offered many plants and expertise as well. Today, some of those original plantings are still here and many others have been added through the years. Spring to early summer is the best time to see native flowers in bloom. California wild flowers, current, mountain lilac and the bright yellow flannel bush come into bloom in the spring. The Matilija poppy, monkey flower and sage bloom into the summer. In late summer and fall, the garden is mostly greens, grays and browns because many natives go dormant to survive the hot, dry summers in Southern California. Visit the garden any time of the year to find the unmistakably California aromas from these plants. You can either relax in the cool shade of Redwood Rest or visit the “Little House” which overlooks an open field and the distant San Gabriel Mountains. Pull up a chair and rest a while in a truly Californian experience. With more than 400 plants featuring 250 different types, Descanso Gardens’ Lilac Garden blossoms into life in spring. From mid-March to the end of April (all depending on nature, of course! ), the lilacs put on spectacular showcase of blooms. With shades of white, violet, blue, pink, magenta and purple, Descanso lilacs have been staging these beauty pageants for more than 50 years in Southern California. It all started in 1953 with a single hybrid, Lavender Lady (Syringa vulgaris 'Lavender Lady'). Many lilacs in the Lilac Grove come from Lavender Lady ancestry: Forrest Kresser Smith in the early 1960s (named after the first board president of Descanso Gardens Guild) and the beautiful pure Angel White from the 1970s. Descanso Gardens has sent lilacs to the National Arboretum and introduced varieties to the nursery trade in 1965. Some of those lilacs include: Guild's Pride, Descanso Princess, Descanso Giant, Chiffon, Forrest Kresser Smith (all shades of lilac); Sylvan Beauty (pink); and Descanso King (blue). Other lilacs were hybridized from crossing Lavender Lady: Dark Night, a stunning purple bloom; California Rose, with subtle pink flowers; and Sensation, a bi-color lilac with deep purple and delicate white edging. As you wander through the Lilac Garden, just remember that these lilacs may seem to not have as much fragrance as those from cooler regions. But there are some sweet days when you can smell them from far away; it’s then you immediately know that spring has arrived. Perched high above the Descanso Gardens landscape on the crest of a hill, the historic Boddy House offers a glimpse of a glamorous bygone era. When E. Manchester Boddy, founder of Descanso Gardens, decided to make Rancho del Descanso his home, he commissioned prominent Los Angeles architect James E. Dolena to create the perfect house to raise his growing family. 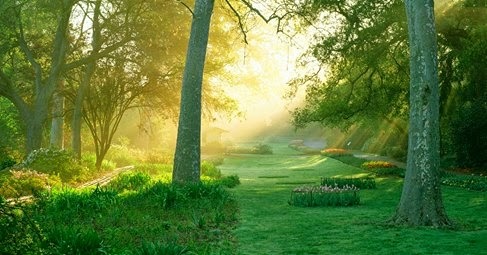 Boddy, publisher and owner of the former Los Angeles Daily News, purchased the land that is now Descanso Gardens in 1937. Dolena was know as the “architect to the stars” for his many commissions in Beverly Hills and Hollywood. The task Boddy handed Dolena: to create a home for himself, his wife Berenice, and their two sons. 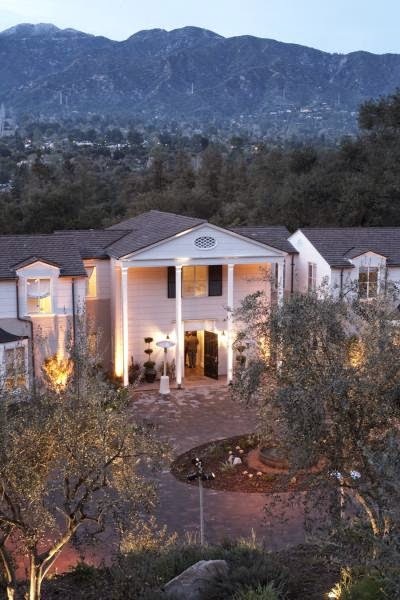 Working in his trademark Hollywood Regency style, Dolena produced a 12,000-square-foot, two story, 22-room mansion for the Boddy family and nestled it into a prominent hillside in the far southeast corner of the property, with a panoramic view of the San Gabriel Mountains. The house incorporated many features that were quite advanced for the day, including steel framing, a built-in stereo music system, and heating and cooling based on geothermal principles. In 1953, Boddy sold his estate — including his house — to Los Angeles County. At the same time, a vigorous volunteer group sprang up to lend assistance and support. Known as the Descanso Gardens Guild, this nonprofit volunteer group led many of the improvements that subsequently have shaped today’s Descanso Gardens. In 2007, Pasadena Showcase House for the Arts chose the Boddy House to be transformed into its 43rd annual Pasadena Showcase House of Design. Working with Showcase volunteers, interior and exterior design firms completely rehabilitated and restored the Boddy House, bringing it back to life in a contemporary re-interpretation of its original Hollywood Regency style. In 2008 Descanso Gardens received a major grant from The Ahmanson Foundation of Los Angeles to return the house to the visiting public as a house museum, an interpretive center showcasing highlights from the history of the property, and an elegant and attractive location for entertaining. Today, a stop at the Boddy House to learn more about the Gardens’ colorful history and heritage should be a must for every first-time visitor. The Boddy House is also available for special events, including weddings, receptions, parties, conferences, meetings and filming. The Boddy House is open from 10 a.m. to 4 p.m. Tuesdays through Sundays. A docent is available to answer visitor questions. Free with admission to Descanso Gardens. To find out if the Boddy House is open prior to your visit, please phone the Visitor Center at (818) 949-4290.